The Odwira Festival is celebrated by the people of Akropong-Akuapim, Aburi, Larteh and Mamfi in the Eastern Region, 30 miles from the capital, Accra. It is also a few minutes drive from the Aburi Botanical Gardens. This is celebrated in the month of September. The Akuapem Odwira festival was initiated by the 19th Okuapimhene of Akropong, Nana Addo Dankwa 1 (1811-1835) and was first celebrated in October 1826. It's significance is to celebrate their victory over the invincible Ashanti army during the historic battle of Katamansu near Dodowa in 1826 and also to cleanse themselves and ask for protection from their gods. This is a very nice town located on the hilly areas of Eastern Region. Due to its hilly terrain, the temperature there is very conducive considering the high temperatures in some other areas in Ghana. Odwira Festival is a week long series of traditions and rituals performed to purify the town, the people and most importantly, the ancestral Stools of the Chieves. It is also a festival to celebrate the harvest of "new Yams". Six weeks prior to the occasion, some activities are forbidden and hefty fines or serious punishment are given to people who violate this ban. Some of these activities include, no loud music, no drumming, no whistling after dark and most of all NO EATING OF YAMS. Men from the three royal families in the town go and clear the path to their ancestral burial grounds. This is the sacred cemetery or "Ammamprobi". This is done to let them know they are invited to join in the festival. In the morning, the men from the royal family return to the sacred cemetery to get the ancestors' permission to perform the festival. As they return, guarded by the "Executioners" or Abrafo(sing. Obrafo) chanting and firing guns, the entire village gather along the streets and cheer these men. A message is given to the chief that the festival can proceed. The ban of all the activities mentioned above are lifted. Yams can now be enjoyed. This day is the Splitting of the New Yam and there's a lot of merry making. But before the yam ban is lifted and the new yam is introduced to the people, people gather in front of the palace cheering and clapping whiles the strongest men in the town "battle" against each other to grab one of the new yams and take it to his house to cook. One yam is introduced at a time until all six of them have been exhausted.This yam game shows who the strongest man is in the village and its also fascinating, exciting and incredible. Trust me, its only in Ghana you can experience festivals of this calibre. This is the day reserved to Mourn the ancestors and all loved ones who passed away. This is also the day all those who died during the six week ban are buried. This is a sad day and usually people wear red or black or both. This is the usual attire Ghanaians wear when there's a funeral. They fast throughout the day to remember dead relatives. Basically, they wail, drink and drum. Caution: This is the day in the year alcohol consumption has been reported to be the highest in the town, so please be careful and drink responsibly on this day. The good thing is guests never buy drinks, its the other way round. This day on the Odwira calender is for Feasting. People exchange foods and other gifts. Some people also pay homage to the chief and queen mother and give them presents of all kinds. The royal families prepare mashed yams with eggs to be sent to a shrine for the ancestors to eat. This food is carried on the head by women guided by men through the principal streets to the shrine. These women look drunk and tired, walk in an uncontrolled manner, stager sometimes, run occasionally and stop abruptly. Some believe that these women are "possessed" by the ancestors as they parade down the street. There's other forms of activities like eating and cooking competitions. This is the day of Celebration. The climax or the peak of the Odwira Festival. The Grand Durbar is held on this day and not only the inhabitants participate, but many dignitaries, chieves and queen mothers from all over Ghana and in fact, anybody interested come to celebrate with the principal chief and queen mother of Akropong. On this day, the Okuapimhene and Queen mother wear their full traditional regalia and display a lot of gold on their heads, necks, wrists, fingers... you name it.This is a very colourful event. They are carried by their attendants above everybody in a palanquin(a boat-like chair) and they dance bouncing in the air, whilst there's drumming and singing going on, on the packed street. There's also lot of gun firing by the scary looking Abrafo. After a couple of hours being "airbourne", the chief is sent to a gathering square or the durbar grounds to be seated. More drumming, dancing and rituals are performed. This is another wonderful thing that can't be seen in any where on this planet but Ghana. The chief and queen mother receive homage from all the sub chieves and queen mothers and other dignitaries. The paramount chief gives his speech after which the celebration continues into the night. There is an Odwira state dance in the evening, raves and many events in the night. Miss Odwira is one beauty contest you don't have to miss. These two days don't really have any thing special going on. There are a few gigs here and there but nothing official. These include soccer matches, scrabble competitions, etc.. etc.. 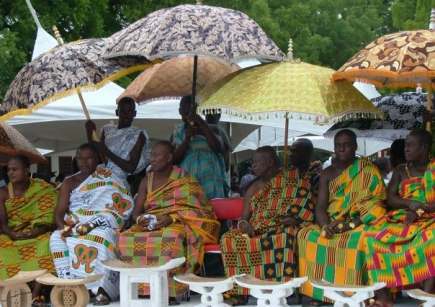 The ‘Krontihene’ of Akuapem holds a special durbar on Sunday as part of the Odwira Festival. The Odwira Festival is one of a kind and there isn't anything like that anywhere. You'll be amazed, electrified and on top of it all, you'll be glad you took part of a rich cultural heritage in the Ghana. The Ashantis also celebrate Odwira festival which is similar to the Akuapims but its mainly dedicated to the purification of the Ashanti stools. Don't worry if you happen to be in Ghana, before or after September, there are at least two festivals in each month. So everybody will have something to witness and say later. Check the Festival Calender for more information. Dipo Festival by the Krobos. Aboakyere Festival by the people of Winneba(the Effutus).